Bridal Bootcamp Diet is a complete fitness and nutrition system created by Cynthia Conde, the Director of Fitness at Gold’s Gym in Astoria, New York, and a personal trainer to many celebrities. Her program is designed especially for women who want to get in shape for their wedding. It focuses on improving the appearance of the areas of the body that most women are concerned about, with a special emphasis on looking great in a wedding dress. Cynthia researched the boot camp training methods of the U.S. armed forces and adapted them for brides. She promises that her program will help brides-to-be build muscle, shape up, burn fat and get started on leading a healthy lifestyle. The program includes six-month, three-month, and four-week regimes, depending on how much time you have until your wedding date. Each regime includes a specific diet, fitness program, supplement advice, and other information. First you will determine the amount of calories required by your body and then you can select from a 1300, 1500 or a 1900 calorie plan. The diet plans provide an intake of carbohydrates, fats and proteins in a ratio of 50:30:20. You will divide your calorie needs into five small meals each day. Conde also recommends that dieters include multivitamins, antioxidants, and protein shakes so as to avoid any potential nutrient deficiencies on a low calorie diet. Spinach, asparagus, Brussels sprouts, broccoli, cabbage, mustard greens, watercress, sweet potatoes, parsnips, pumpkin, carrots, potato, apples, berries, peach, pear, cantaloupe, pineapple, mango, meat, chicken, fish, eggs, soy milk, low fat milk, yogurt, brown rice, barley, buckwheat, corn, millet, lentils, chickpeas, low fat salad dressing, low fat mayonnaise. The fitness plans on this program are quite demanding and must be followed as outlined for optimal results. For the online program all dieters commence on level one, which involves an hour of military style training, four times a week. There is also the option of doing a more intense, two-hour session twice per week. This schedule should be followed for at least six weeks. Dieters can then progress to level two which incorporates functional training that uses your own body weight to build core strength and create a lean and fit body. The level two program involves one hour, three times a week. 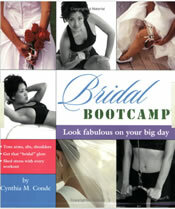 The Bridal Bootcamp book retails at $14.95. The online program is available at a cost of $4 a week billed quarterly (every 13 weeks), with a five-week minimum commitment. Targeted specifically to women who want to lose weight for their wedding day. Includes a customized nutrition plan. Provides adequate protein, which reduces appetite and maintains muscle mass while dieting. Customized to suit your goals and trouble spots. Created by a certified fitness trainer. Exercises can be performed either in a gym or at home. Includes access to an online community. Meal plans do not include an adequate intake of vegetables. Diet does not provide adequate essential fats. Exercise program may be too intense for many dieters. May not be relevant to dieters outside the target audience. Diet plan contains a limited variety of foods, which may lead to nutrient deficiencies. Online program is very expensive in comparison to most other programs. Bridal Bootcamp involves an intense regime of exercise combined with reduced calorie dieting. What makes this program unique is that it is targeted to suit the individual needs of brides-to be with a customized program that concentrates on improving the appearance of specific trouble spots. I just want to know if Cynthia was born a male or female. Any one know? Interesting book. I have been following the 50-30-20 diet for a year and I found it to be one of the most amazing nutritional plans out there and not just for getting ready for a special even like a wedding. I like this plan because it is something that is incorporated into my life and lifestyle.